In light of the succession of tax reforms being pushed in Congress, advocates for renewable energy encouraged legislators to levy a tax on coal to discourage dependence on dirty energy in the country. Center for Energy, Ecology, and Development, Inc. (CEED) Executive Director Gerry Arances presented in front of the Senate Committee on Ways and Means, representatives from the coal and power industry, as well as other members of the cabinet, expressing support for the enactment of an excise tax on coal. “To levy a tax on an act is to discourage behaviour by penalizing it, and this is what we need the government to do regarding coal,” said Arances. “At present, the coal industry enjoys one of the most lopsided revenue-sharing agreements in the country, with coal companies able to deduct as much as 90 percent of gross proceeds from coal as expenses, the highest recoverable cost among extractive industry,” he added. Arances further noted that under the current fiscal regime, local governments are entitled to only 1.2 percent of the gross proceeds from coal while the national government is left with only 1.8 percent. “This obvious bias for coal contradicts many policies professed by the government,” Arances emphasized. “It runs contrary with the Department of Energy’s professed ‘technology-neutral’ policy, with the concept of fair competition in the energy market, and runs contrary with the commitment to increase renewable energy in the energy mix as espoused in the Renewable Energy Law,” he stressed. 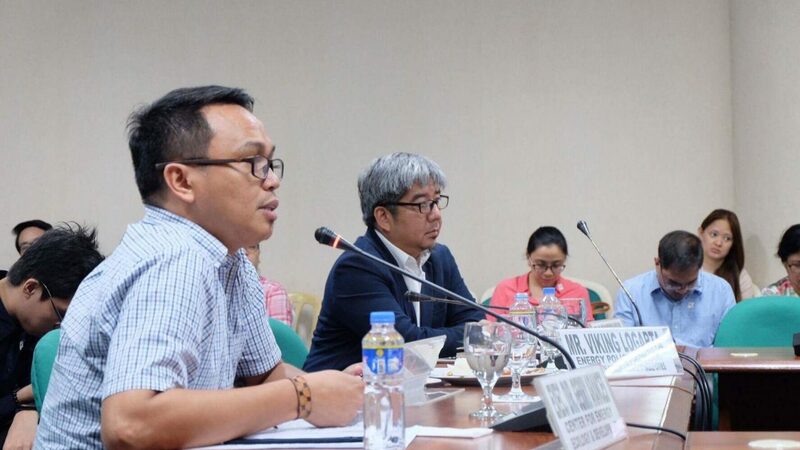 Arances also pointed out that a responsive use of the revenue generated from such a tax mechanism would be to continue the research and development to tap the country’s renewable energy potential. “Going beyond levelling the playing field for renewable energy to compete in the market, the tax can also be used to pursue a cleaner energy path for cleaner, more sustainable development,” Arances stated. “Proceeds from the tax can be coursed to a fund which would finally give clean and cheap energy for more than 20 million Filipinos who lack access to electricity.” In response to the concerns of Meralco and other power generation companies relying on coal, Arances urged the Senate to come up with safeguards to keep power companies from shifting the burden of additional costs of coal to consumers. “The tax mechanism must provide safeguards from any pass-on provision which would only defeat the purpose and spirit of an excise tax on coal. This can be done by expanding ‘lifeline rates’ which subsidizes marginalized or low-income electricity consumers,” Arances noted. “It is high time that we finally internalize the externalize costs of coal, which have been shouldered by those whose livelihoods and environment have suffered pollution and destruction from the burning of this dirty resource,” Arances continued. “Such a tax mechanism on coal is a positive step towards fulfilling the constitutional mandate of the government in promoting a healthful and balanced ecology for all generations,” he concluded.